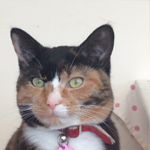 Lula has made a fantastic recovery from a broken hind leg she sustained in a road traffic accident. Lula loves spending her nights on the prowl looking for mice. Sadly her adventures proved costly when she was clipped by a car. Thankfully she was relatively unscathed apart from her leg, which after the insertion of a steel pin and six weeks cage rest has completely healed. Should I be worried about my pet’s lump? Grooming and regularly stroking your pets is a very important part of pet care – not just because you and your pet will enjoy it, but also to alert you to any parasites, embedded grass seeds, developing tumours and a host of other issues. If you do find a lump on your pet there are many possible underlying causes. These include abscesses (particularly common in cats), bee and wasp stings, hernias (often seen in younger pets) and tumours. Tumours are understandably the most worrying and can be either benign, which tend to be slow growing and remain in one place, or malignant which can be fast growing, invade the surrounding tissues and have the potential to spread to other parts of the body. 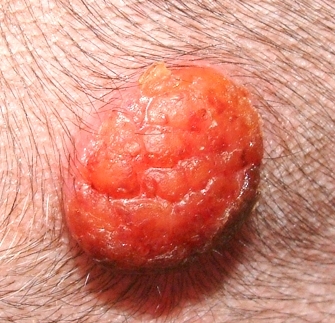 If you do find a lump on your pet it is very important that we examine it as soon as possible. Speed is of the essence and a delay in appropriate treatment can make the difference between a small mass that is easily treatable and one that is far more difficult to treat or is sadly sometimes untreatable. New lumps, sudden changes, rapid growth, discomfort, swelling, oozing, inflammation, itchiness. 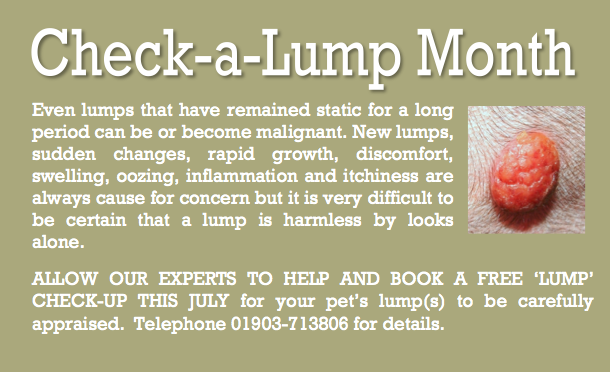 It is very difficult to be certain that a lump is harmless by looks alone so allow our experts to help. Fitzalan House Vets are offering FREE check-ups for your pet’s lump(s) to be carefully appraised this July.